Complete crop failure at the seedling stage. Specific leaf symptoms appearing at varying times during the season. Internal abnormalities such as clogged conductive tissues. Obvious yield differences, with or without leaf symptoms. Poor quality of crops, including differences in protein, oil, or starch content, and storage quality. Yield differences detected only by careful experimental work. Each symptom must be related to some function of the nutrient in the plant. A given nutrient may have several functions, which makes it difficult to explain the physiological reason for a particular deficiency symptom. For example, when N is deficient, the leaves of most plants become pale green or light yellow. When the quantity of N is limiting, chlorophyll production is reduced, and the yellow pigments, carotene and xanthophylls are shown through a number of nutrient deficiencies produced such as pale green or yellow leaves, and the deficiency must be further related to a particular leaf pattern or location on the plant. The visual symptom may be caused by more than one nutrient. For example, N-deficiency symptoms may be identified, although S may also be deficient and its symptoms may not be readily apparent. B deficiency is accompanied by a red coloration of the leaves near the growing point when the plant is well supplied with K. on the other hand, when the K content is low, yellowing of alfalfa leaves occurs. Deficiencies are actually relative, and a deficiency of one nutrient may be related to an excessive quantity of another. For example, Mn deficiency may be induced by adding large quantities of Fe, provided that soil Mn is marginally deficient. Also, at a low level of P supply, the plant may not require as much N compared to normal or adequate P. In other words, once the first limiting factor is eliminated, the second limiting factor will appear (Liebig’s law of the minimum). It is often difficult to distinguish among the deficiency symptoms in the field, as disease or insect damage can resemble certain micronutrients deficiencies. For example, leaf hopper damage can be confused with deficiency in alfalfa. A visual symptom may be caused by more than one factor. For example, sugars in corn combine with flavones to form anthocyanins (purple, red, and yellow pigments) and their accumulation may be caused by an insufficient supply of P, low soil temperature, insect damage to the roots, or N deficiency. Nutrient deficiency symptoms appear only after the nutrient supply is so low that the plants can no longer function properly. In such cases, it would have been profitable to have applied fertilizer long before the symptoms appeared. If the symptoms are observed early, it might be corrected during the growing season. Since the objective is to get the limiting nutrient into the plant as quickly as possible, with some nutrients and under some conditions this may be accomplished with foliar applications or side dressings. Usually the yield is reduced below the quantity that would have been obtained if adequate nutrients had been available at the beginning. However, if the problem is properly diagnosed, the deficiency can be corrected the following year. Hidden hunger refers to a situation in which a crop needs more of a given nutrient yet has shown no deficiency symptoms. The nutrient content is above the deficiency symptom zone but still considerably needed for optimum crop production. With most nutrients on most crops, significant responses can be obtained even though no recognizable symptoms have appeared. Figure. 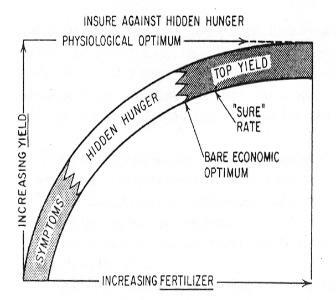 Hidden hunger is a term used to describe a plant that shows no obvious symptoms, yet the nutrient content is not sufficient to give the top profitable yield. Courtesy: The Potash Phasphate Institute, Atlanta, Ga. The question, then, is how best to eliminate hidden hunger. Testing of plants and soils is helpful for planning or modifying plant-nutrient programs to avoid this problem in subsequent crops. In both approaches, careful consideration must be given to past management practices. Light green leaf and plant color with the older leaves turning yellow, leaves that will eventually turn brown and die. Plant growth is slow, plants will be stunted, and will mature early. Plants will be dark green in color and new growth will be succu­lent; susceptible if subjected to disease and insect infestation; and subjected to drought stress, plants will easily lodge. Blos­som abortion and lack of fruit set will occur. Plants fertilized with ammonium-nitrogen (NH4- N) may exhibit ammonium-toxicity symptoms, with carbohydrate depletion and reduced plant growth. Lesions may occur on plant stems, there may be a downward cupping of the leaves, and a decay of the conductive tissue at the base of the stem with wilting of the plants under moisture stress. Blossom-end rot of fruit will occur and Mg deficiency symptoms may also occur. Plant growth will be slow and stunted, and the older leaves will have a purple coloration, particularly on the underside. Phosphorus excess will not have a direct effect on the plant but may show visual deficiencies of Zn, Fe, and Mn. High P may also interfere with the normal Ca nutrition, with typical Ca deficiency symptoms occurring. On the older leaves, the edges will look burned, a symptom known as scorch. Plants will easily lodge and be sensitive to disease infestation. Fruit and seed production will be impaired and of poor quality. The growing tips of roots and leaves will turn brown and die. The edges of the leaves will look ragged as the edges of emerging leaves stick together. Fruit quality will be affected with the occur­rence of blossom-end rot on fruits. Plants may exhibit typical Mg deficiency symptoms, and when in high excess, K deficiency may also occur. Older leaves will be yellow in color with interveinal chlorosis (yellowing between the veins) symptoms. Plant growth will be slow and some plants may be easily infested by disease. Results in a cation imbalance showing signs of either a Ca or K deficiency. A general overall light green color of the entire plant with the older leaves being light green to yellow in color as the deficiency intensifies. A premature senescence of leaves may occur. Abnormal development of the growing points (meristematic tis­sue) with the apical growing points eventually becoming stunted and dying. Rowers and fruits will abort. For some grain and fruit crops, yield and quality is significantly reduced. Leaf tips and margins will turn brown and die. Younger leaves will be chlorotic and plants will easily wilt. For wheat, a plant disease will infest the plant when Cl is deficient. Premature yellowing of the lower leaves with burning of the leaf margins and tips. Leaf abscission will occur and plants will easily wilt. Plant growth will be slow and plants stunted with distortion of the young leaves and death of the growing point. An Fe deficiency may be induced with very slow growth. Roots may be stunted. Interveinal chlorosis will occur on the emerging and young leaves with eventual bleaching of the new growth. When severe, the entire plant may be light green in color. A bronzing of leaves with tiny brown spots on the leaves, a typical symptom frequently occurring with rice. Interveinal chlorosis of young leaves while the leaves and plants remain generally green in color. When severe, the plants will be stunted. Older leaves will show brown spots surrounded by a chlorotic zone and circle. Symptoms will frequently appear similar to N deficiency. Older and middle leaves become chlorotic first, and In some instances, leaf margins are rolled and growth and flower formation are restricted. Upper leaves will show interveinal chlorosis with an eventual whiting of the affected leaves. Leaves may be small and dis­torted with a rosette form. An Fe deficiency will develop. Chlorosis is a physiological disorder that occurs to deficiency of mineral elements (eg; Mn, K, Zn, Fe, Mg, S and N). Leaves or plant parts become abnormally yellow. Mottled is surface marked with coloured spots (anthocyanin develops) eg. Due to deficiency of N, Mg, P, S.
Necrosis refers to patch of dead tissues, due to the deficiency of Mg,K, Zn, Ca and Mo.